How might archives give rise to art? Is obsession with the letter a threat to spirit? When does the lamp shed light on life, and when does it simply make learning stink? 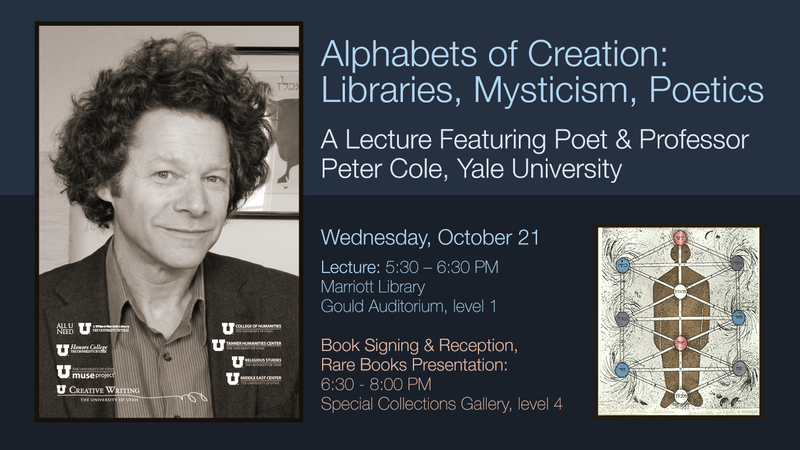 In a playful and probing presentation, poet and translator Peter Cole will explore the role of language, libraries, and mystical linkage in the process of poetic creation. Peter Cole has been called an “inspired writer” (The Nation) and “one of the most vital poets of his generation” (Harold Bloom). He is the author of four books of poetry. 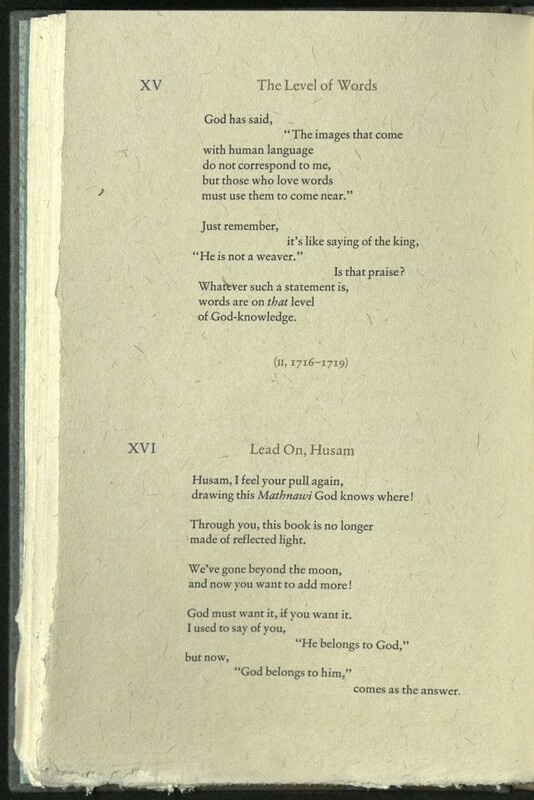 Cole’s translation from Hebrew and Arabic, The Dream of the Poem: Hebrew Poetry from Muslim and Christian Spain, c. 950-1492, received the National Jewish Book Award and the American Publishers Association’s Award for Book of the Year. He has received numerous honors for his work, including a Guggenheim Foundation fellowship, an American Academy of Arts and Letters Award in Literature, and the PEN Translation Prize. In 2007 he was named a MacArthur fellow. Born in Paterson, New Jersey, Cole now divides his time between Jerusalem and New Haven, where he tends small gardens that fill his poetry. These pieces and others from our rare book collections helped inspire Peter. How will they inspire you? Al-Mutanabbi Street in the heart of Baghdad, is named after the 10th century Arab poet Abu’ Tayib al-Mutanabbi. For centuries the winding street has been the center of Iraqi literary movements. Lined with booksellers and bookshops, scholars, poets, readers, writers and artists met to perform, debate and create. Shabandar Café, which opened in 1917, was the heart of this community. On March 5, 2007, a car bomb exploded in this crowded intellectual marketplace. Thousands of books and other written documents were destroyed. More than thirty people were killed, more than one hundred injured. In response to the attack, California poet and bookseller Beau Beausoleil brought together a coalition of poets, writers, readers, artists, booksellers and printers to comment on the implications of attack on culture as a way to conquer. Poem written in memory of those who lost their lives in the car bombing of 5 March 2007 on al-Mutanabbi Street in Baghdad. 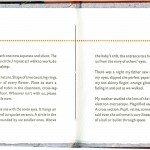 The poet and artist is a first generation Iraqi-American. Poem typeset in Gill Sans, title in News Gothic Condensed on Somerset text paper. 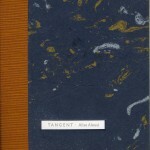 Endsheets handmade by swirling strips of Arabic text that read “al-Mutanabbi Street” with cotton pulp. Handsewn into boards covered in Japanese silk with Indian marble paper pastedowns. 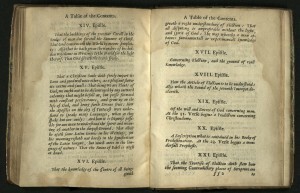 Edition of forty copies. University of Utah copy is no. 33. Gallery hours: Monday–Friday, 8:00–6:00; Saturday, 9:00–6:00; Hours differ during University breaks and holidays. De Humani Corporis Fabrica of Andreas Vesalius (1514-1564) was an exquisite piece of creativity that blended observation; organization of information, format, typography; and illustration into an integrated whole to accurately describe the human body. The intense collaboration between scientist, artist, and printer was unprecedented. Prior to the publication of this book, medical texts were mostly derived from the medieval Arabic medical tradition or from translations of the works of Classical authors, whose texts had been corrupted by translation and re-translation: from Greek into Syriac, Syriac into Arabic, Arabic into Latin. Renaissance Europe embraced the classical works of Hippocrates and the Greco-Roman Galen. 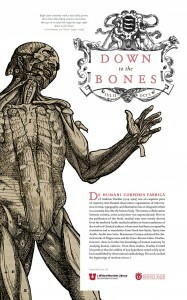 Vesalius, however, chose to further his knowledge of human anatomy by studying human cadavers. From these studies, Vesalius formed his position that the validity of any hypothesis rested solely upon facts established by observational methodology. His work marked the beginnings of modern science. 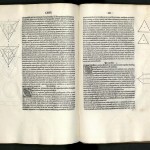 This is the editio princeps, or first printed edition, of Euclid’s Elements of Geometry, the oldest mathematical textbook still in common use today. The Greek mathematician Euclid compiled the work around 300 BC. Its success can be attributed to its simple structure where each theorum follows logically from its predecessor. 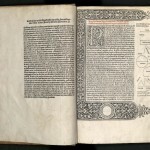 In 1482, Erhardt Ratdolt, famous for his beautifully produced scientific books, printed eight works – Euclid’s Elements among them. Ratdolt’s fame largely rests upon this edition of Elements. 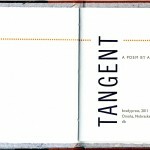 It is the first printed book to contain geometrical figures. An elegant three-sided woodblock and a white-vine style woodcut initial, several hundred small ornamental capitals, and more than four hundred and twenty carefully designed and perfectly printed marginal diagrams, confirm its standing as a landmark publication. The page layout, particularly the first page, is an outstanding example of Ratdolt’s consideration of the overall look and readability of his work. 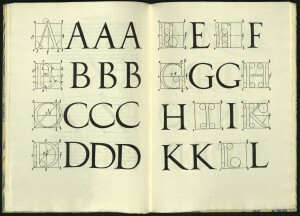 Note the closeness of the type to the initial and the close set of the text page. For the text, Ratdolt used a type called “rotunda” or “round-text.” The Italian writing-masters called this littera moderna. 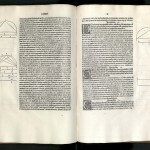 Ratdolt’s book was based on the standard Euclid of the later Middle ages: Abelard of Bath’s twelfth-century translation from the Arabic, revised in the following century by Campanus of Novara (d. 1296). 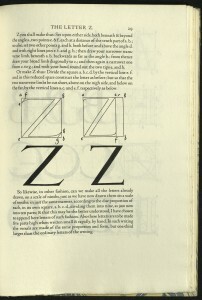 In his dedication to this edition, Ratdolt suggested that the scarcity of printed mathematical works was due to the problems involved in printing the geometrical diagrams. He then happily announced that he had discovered a method of printing them as easily as the text. 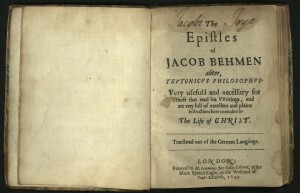 He did not elaborate upon this method, but it most likely involved the use of type-metal rule arrangements that could be printed along with the text. George Gough Booth, publisher of the Evening News (which became The Detroit News) became so enamored of the Arts and Crafts movement that he based the Cranbrook Educational Community he founded on William Morris’ philosophy. Booth established, with the help of Edward Miller, the Cranbrook Press, which published illuminated books. 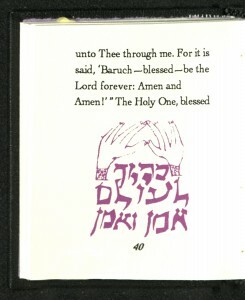 Jean Eschmann created fine bookbindings for the publications. 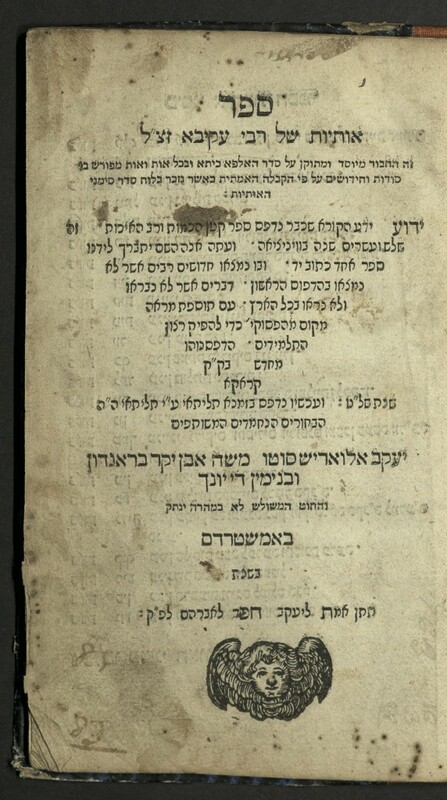 This is Lord Rivers’ translation of Tignonville’s French version of the Dict philosoporum, a collection of sayings originally compiled in Arabic. 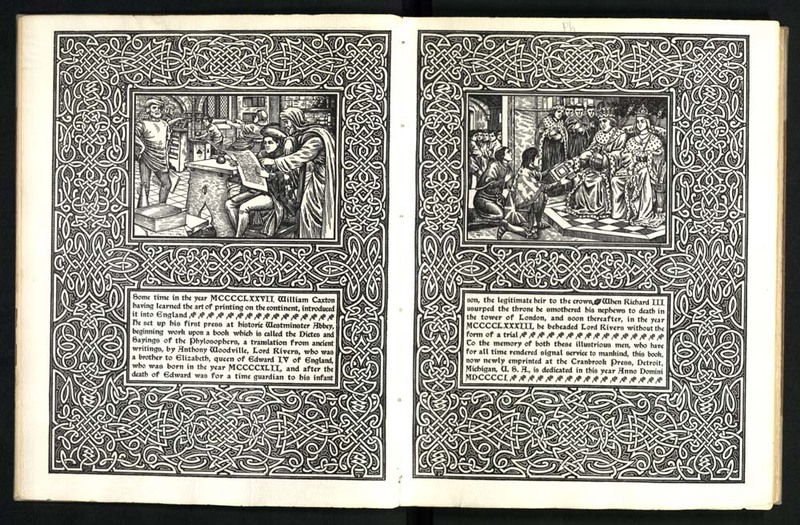 It was first printed in English by William Caxton. 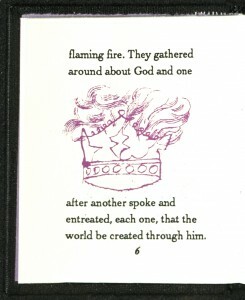 Printed by Edmund Booth. 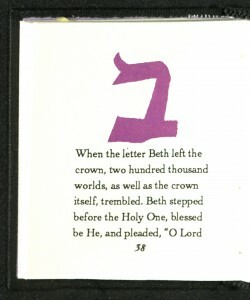 Woodcut initials, borders, head and tail pieces from designs by George G. Booth, including two original copper engravings, from drawings by De Voss W. Driscoll. 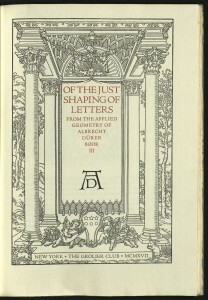 Some pages surrounded by ornamental borders. University of Utah copy is no. 109.